When the first snap of cold air hits, many of us find ourselves grabbing for a pair of slippers to keep our toes toasty. If you’re in need of a pair this season, these Cloud Nine Slippers fit the bill to a tee. They’re a quick project, medium difficulty, and are both comfy and cute. 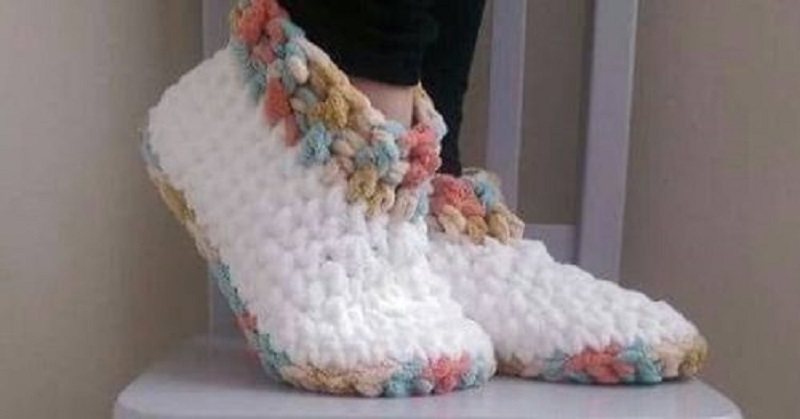 To make your own pair of these delightfully cozy slippers, you’ll need a size “N” crochet hook and the secret ingredient, Bernat Blanket yarn, which is the reason why these slippers feel so luxurious. You’ll also need to know the following stitches: chain, slip stitch, single, double, half double crochet, and both front post and back post double crochet, as well as “sc2tog” and “hdc2tog” and “dc3tog” (single crochet two stitches together, half double crochet two stitches together, and double crochet three stitches together). These are standard crochet stitches and can be learned quickly from a variety of tutorials and videos. The pattern, which is free, comes in three sizes: 5-6 1/2, 7-8 1/2, and 9-10 1/2. The slippers are worked from the sole up in ten rounds – a chart at the end of the pattern is available for your convenience. These slippers would make a perfect gift for charities during the holidays, as well as family (particularly older relatives), friends, and of course, yourself. You can find the free pattern at Dorianna Rivelli’s site, The Lavender Chair.